The tablet computing market might be all about the iPad, but Acer is betting there are some people out there who want the utility of a tablet with the business and software capability of a Windows machine—and hopes the Acer Iconia Tab W500 will fit the bill. Built around a 10.1-inch display, the convertible tablet weighs just 2.14 pounds and features a separate docking keyboard, enabling users to tap into a world of Windows software without trying to manage everything via a touch interface. 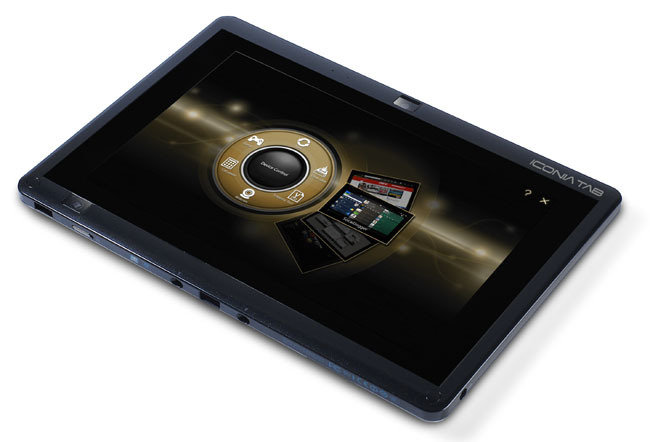 The Iconia Tab W500 features a 10.1-inch 1,280 by 800-pixel LED backlit display and is powered by an AMD C-50 processor with ATI Radeon HD 6250 graphics. The tablets sport 2 GB of RAM and 32 GB of solid-state storage, 802.11a/b/g/n Wi-Fi and Bluetooth wireless networking, and two 1.3 megapixel webcams (front and back) for taking pictures and using video chat. Like other Acer Iconia products, the tablet features the “Acer Ring,” a touch-based interface that enables users to move between applications and services using a gesture interface—the tablet also features Acer applications for keeping up with social networking sites, touch-driven media applications, and scrapbooking utilities. The Iconia Tab W500’s unique feature, however, is the docking keyboard: for users who need to manage Windows with a more-traditional interface—and, given Windows 7’s touch capabilities, that would be most people—users can dock to a full-sized chiclet keyboard, which connects via USB and snaps into place with hidden magnets. 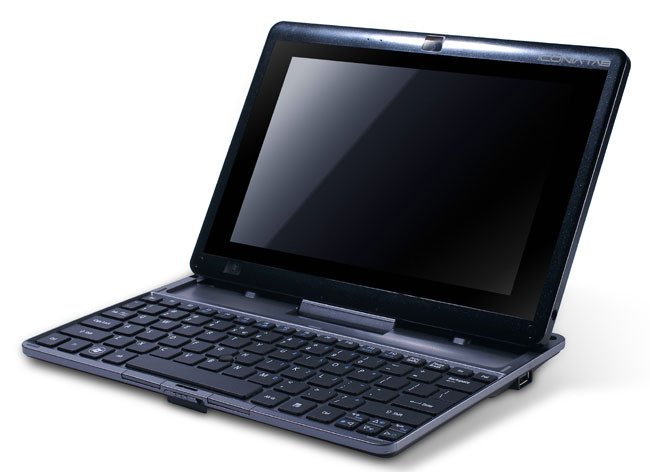 The keyboard holds the tablet at a comfortable angle, and also offers expanding connectivity for the W500, including onboard Ethernet and a USB port for external devices like storage or printers. The keyboard adds an additional 1.34 pounds to the W500 setup, but for people who need Windows, that’s a small price to pay. When folks want entertainment, there’s an HDMI port that can be used to push 1080p content to a high-definition display. The Acer Iconia Tab W500 will initially be available in two configurations: the W500-BZ467 sports Windows 7 Home Premium and has a suggested price of $549.99, and the W500-BZ841 comes with Windows 7 Professional and has a suggested price of $619.00. Both should be available at U.S. retailers now.